Ever since I've moved to Athens, I've been excited about the possibilities of new, interesting photo locations. For my style blogging self, this town is a photogenic dream: it's got deep Southern history and a highly-respected music scene. 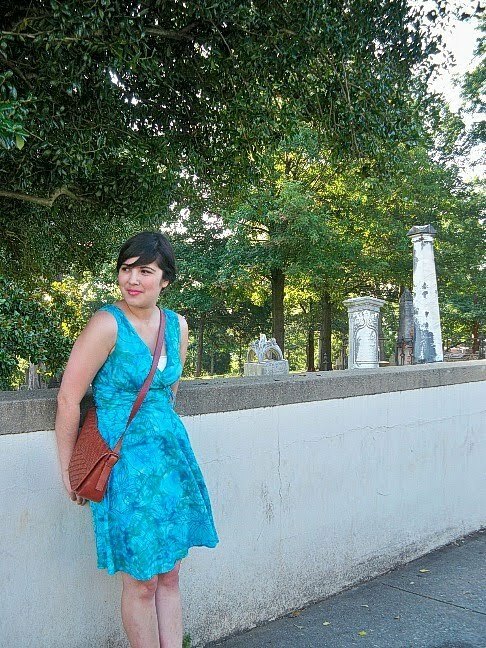 Two of the places that I've been interested in taking outfit photos are two of the oldest in the area: cemeteries near the University of Georgia's campus which contain the remains of some early citizens who helped shape this city. But when I went to one cemetery yesterday morning for some photos, I was struck by an ethical dilemma: is it inappropriate to take style-related photos in a place for the dead, like a cemetery? To be clear, the cemetery I went to was centuries old and is part of the National Register for Historical Places; its main time of use was between 1810-1850s. And though this particular one has long been touted as a beautiful place, it made me wonder whether it would be any different from taking photos in a more modern cemetery, where the dead have been gone for less time. My time at this cemetery concluded after a flustered 10 minutes, which resulted in a hurried set of photos (the one up top was the best one of the bunch, sadly). In my desire to be unobtrusive, I took all the photos near the stone wall that encompasses the cemetery, literally showing my hesitation to cross any lines. My personal experience may be the instigator for my sensitivity. I've lost many loved ones in my life, the closest of whom was my father a few years ago. Taking photos in a cemetery made me wonder if I would be comfortable doing style shoots near his grave, or if, in an older graveyard, I would be comfortable doing the same near my great-great grandfather's. Would it bother me if another fashion blogger did the same? It's a tricky situation when you apply the personal, but the idea of artistic expression in a place of mourning persists. It's a squeamishness that reminds me of my summer in New York a couple years ago, where my internship required a daily walking commute right by the World Trade Center site. For three months, I walked by the construction, and observed many kinds of tourists. The most striking were the visitors who took smiling photos in front of the ashy remnants, as nearby street vendors hawked 9/11 memorabilia in the form of t-shirts, mugs and magnets. Not every visitor behaved in this way, but it did make the site a dichotomy of sorts -- a juxtaposition of a hallowed ghost town and a circus, a place in which mourning became a Facebook profile photo, a tourist location, a business. Though it's on a smaller scale, that photographic behavior could be applied to blogger photo shoots in cemeteries; the living is pushed to the forefront, while the dead often provide a backdrop to the action. This isn't some final judgment to say that style bloggers who have done cemetery-related photos committed some terrible blasphemy. In fact, some of the works I've seen inspired my photo shoot attempt. Cemeteries have long been a theme in art and literature, and it's no wonder why. There's beauty to be found in the crumbling of old headstones; the calligraphy of epitaphs; the religious themes in statues; the uniformity of neat rows of plots and bouquets. The location has many elements of Romanticism, Gothicism and has enough of an atmosphere of pensiveness, that it's understandable why many have been drawn to it. Interpretation, much like beauty, is in the eye of the beholder, and so I'm wondering what you all think about taking style photos in cemeteries. What kind of context would be involved to deem it appropriate/inappropriate to you? Should there be a distinction between older, historic cemeteries and more modern ones (and let's define "modern" as its occupants being dead 60 years or less)? And do you think there are places that should be deemed off-limits for photo locations in style blogs? This is an interesting post. Since I live in the New Orleans metro area and cemeteries are a 'tourist' attraction here... I used to be accepting of photos being taken here. When my MIL died last year, and we buried her in one of the cemeteries that are frequently visited as part of a cemetery tour, my acceptance of people going there for tourist reasons diminished. The cemetery is over 200 years old, but people are buried there still today. As a mourner, I get a bit distracted and also feel a bit invaded when tourists are wandering the cemetery while I'm trying to have a visit with my MIL.. sometimes I'm crying or sad and the last thing I want is for a handful of tourists to walk around and take a picture of me in that state. At the same time, I appreciate that they are curious about the cemetery, but I almost feel like a level of respect is missing when it comes to cemetery visitors. Just my opinion, I totally understand where you are coming from! I agree with Andie, this is kind of a touchy item. I've done informal tours through beautiful and historic cemetaries before but I've always felt like I needed to be super respectful since I am in a resting place for others, regardless of how long ago they passed. I think that your hesitation about taking your pics in that location may be a sign to you that if you're not comfortable there doing what you're doing, it may be good to look for another beautiful alternative that doesn't raise Qs to you about appropriateness. I understand and appreciate the beauty of these historic places but I would personally feel weird about taking photos there, especially if the reason isn't to highlight the place specifically. These are just my thoughts and how I feel though, and I know there are those who would disagree! Wow. What a fascinating subject. I think there is a thin line here. I don't think that taking photos in a cemetary is disrespectful in and of itself. Taking photos because you think it's a beautiful location and you are being respectful of the area is a wonderful thing, in my opinion. On the other hand, if there ARE mourners there visiting a loved one's site, I do think that a different location should be sought. As beautiful and respectful as it might be to take photos of something with so much history, some of that respect is lost when it disturbs a visitor in mourning. If the photos can be done when there is no one else around (except other tourists not visiting specific sites), then I think it would be okay. Hi Joann! I don't think I've posted here before, but I really admire your blog. As for your question, I think it really depends. I think it would definitely be inappropriate if you had a fashion shoot while there were mourners there, so I guess it is important whether it is a current or historical cemetery. On the other hand, if I were the one in the ground (and I promise I'm not usually this morbid! ), I would want the cemetery to be a happy place, not one that was always full of sadness. So in that sense, I wouldn't mind people taking their pictures. I think you can take photographs in a cemetery while still being respectful, but like Melissa said, it's a thin line. While I wouldn't want to take outfit shots while a funeral service was going on or near graves where there were mourners, I don't have a problem with it in genera. I don't mean to be flippant, but I don't think the dead care. I think part of my perspective on this is informed by the fact that I'm a runner, and cemeteries often make great locations to run in urban settings (you don't have to worry about getting hit by a car, etc). Hi Joann! I love the thoroughness of your blog. Very developed ideas here. I would have to say that, regardless of whether taking pictures in/around a graveyard is wrong or right to you or me, any shot discernibly near a graveyard will elicit unwanted baggage from your viewers. The shot becomes about the environment, so you're right about suggesting that possibility. I am not sure what I would do if given the opportunity to shoot in a cemetary. There is one near where I grew up that a film crew wanted to use while they were making Interview with a Vampire. It's a very old cemetary in places but parts of it are still in use. A lot of the residents and churchgoers were against the idea and in the end, the film crew mocked up a cemetary somewhere else. It's a touchy subject.